If you want to meet somebody who is an amazing fit for you, it only stands to reason that they’ll be looking for the same in a partner. Somebody makes them feel good, somebody who brings light into their life. If you’re going through life with your head down, and letting every little obstacle take its toll, it might be time to start considering an overhaul in regards to your outlook. On the contrary, when you try to keep a positive attitude (even when it’s difficult), and not let the little things bring you down, this also tends to snowball. When you’re letting stress get the better of you, you won’t always be yourself. You might find yourself snapping at servers or people at the grocery store, or getting really worked up in traffic when somebody else isn’t driving up to your standards in their vehicle, or any other number of perceived slights. Granted, if someone is driving unsafe, or doing their job very poorly, these are legitimate reasons to get a little bit irked, but you have to pick your battles, and not let it bring you down. This is easier said than done, especially if you’re already on that downward spiral of stress, frustration, and anger. Sometimes, you might not even realize it! 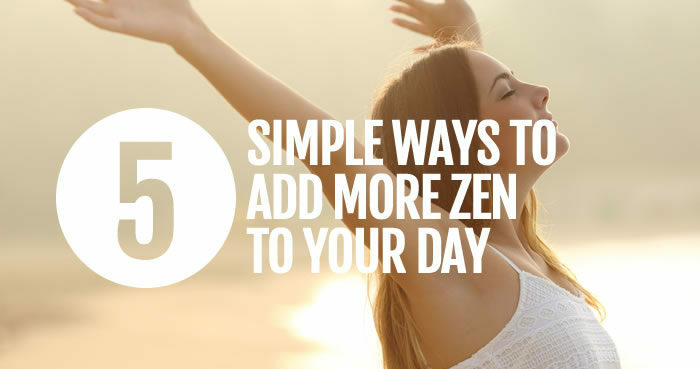 We’ve put together this list of 5 very simple things that can help you to live a calmer, more relaxed, more focused, and happier life. It’s an on-going process, and things won’t change overnight, but even if you’re already in generally good spirits – hopefully these five tips will still bring you added joy. Whether it’s yoga, reading a good book, or simply just taking five minutes at your lunch break to do absolutely nothing… It might sound strange, but relaxing is actually something that we need to actively work on sometimes, it’s not just a passive endeavor. We’re not saying you need to literally put on a ceremony to relax, but having some sort of ritual involved can help, whether that means a special seat near the garden that you never think about work while sitting in, or a chunk of time you take to just lay out on the floor and breathe deeply, or something more formal like a yoga class or a video you follow along with at home. The same way you can feel that stress wash over you as soon as you get to work because of the environment, you can create a positive version of this for yourself as well. It’s literally creating your “happy place”. A nice cup of warm tea can be a great way to end the day, especially since there are a variety of health and wellness benefits associated with a lot of the different types of tea. Something like peppermint tea, chamomile tea, or even a cup of green tea before bed can really set your mind at peace. This ties into the idea of ceremonial relaxation, as there can be a whole ceremony involved with preparing and enjoying tea. Some of the more traditional ways to prepare tea aren’t very practical, for example a gongfu, which is more involved than a simple tea bag in hot water, but there’s just something about being in the moment as you prepare and enjoy this, or any other drink, than can be very calming. Add that to the fact that teas have a variety of calming properties of their own, and this small adjustment each night, or each morning for that matter, can do a lot when it comes to calming a busy mind and getting a better rest, which is a huge step towards living a happier life overall. We already alluded to the idea of “picking your battles”. That doesn’t mean you should be going out and actively looking for battles, it just means that sometimes it’s really not worth getting into it with someone, or getting upset over something, when you think about the toll you’re taking on yourself. If someone messes up your order at a fast food place and you’re already late on your way home and the family is nagging you about being hungry, it’s the easy way out to take it out on the person working at the window, but it’s really not their fault. Accidents happen, there are a lot of moving parts, orders get mixed up, and you never know – the person putting your dinner in a bag could have their own burdens that they’re trying to live with, they have their own families nagging them, they have their own bills and their own stresses, they don’t need someone else taking everything out on them. It’s not going to help. It’s not going to fix your order. It’s just going to create more negativity for you, and for them. You’ll probably feel guilty about it later, and at the end of the day, that’s an example of picking the wrong battle. At the risk of sounding cliché, you really do have the ability to filter in and filter out things in a way that can have a big impact on whether you have a good day or a bad day, or whether you feel overwhelmed and bad or at least a little bit happy, even in not-so-great patches of your life. Nobody likes that person that’s just incredibly overly positive to a point where it’s clearly fake, that’s always telling you to look at the silver lining even during your worst moments, and frankly sometimes people will over do it, but that doesn’t mean this can’t be an effective strategy, at least to a smaller degree than the people who take it to the extreme. If you bike gets stolen from your garage or somebody grabs your BBQ in the middle of the night, we don’t expect you to immediately sit there and focus on all the positive aspects because there really aren’t any, but having that “why me” and “Yet another example of the universe going after me” kind of attitude is taking it to the opposite extreme. If you feel like you’re an unlucky person, and there’s some unnamed force in the universe trying to hold you back, it’s really just the confirmation bias of a negative attitude. Bad things happen to everyone, sometimes they happen more frequently and more close together, but sometimes they don’t. Are you someone who notices when the bad things happen, or chooses to focus on the times when they aren’t happening? If you’re looking to meet someone incredible to have a massive positive impact on your life, you’re going to need to be that for them, too. If you’re living life with this dark cloud following you around, are you really going to be that positive force for someone else? Unlikely. There’s really not much else to say about this point, it’s just a matter of putting it all together. It’s not always a tangible thing, either. It’s not like a video game where you have “Happiness” points, but following the five tips in this article, along with everything else that works for you, can make a big difference in becoming a more magnetic person in respect to attracting the kind of people that you want to be around, and the kind of people who are going to enrich your life, whether it’s for friendships or for romantic relationships.